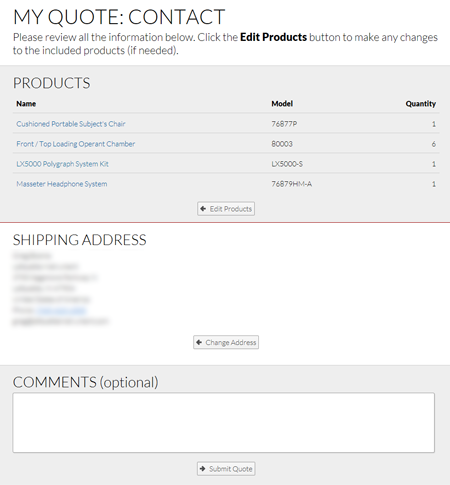 We have developed an improved Quote Request System for our customers to streamline the process. 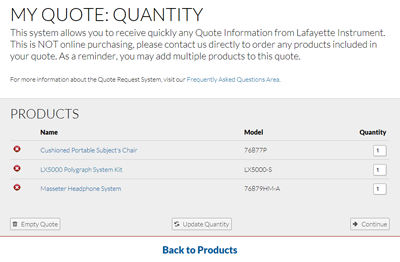 The Quote Request System is an automated system open to all Lafayette Instrument customers; it tracks flagged products of interest by the simple task of clicking a link located on every product page. It will then send an email containing the price of said products upon filling out a small form. Figure 1 highlights the Add to Quote Request Button.Once a product has been added to your quote request, you will be taken to the quote request main-hub (Figure 2). As you can see from Figure 2, you may enter as many products to the Quote Request as you desire. There is no longer any need to send a different request for each product. We would also like to send you a formal quotation that includes a product selection review, shipping cost estimate and any quantity or package discounts that may apply to your request. To continue the quote process follow the button marked "Continue". 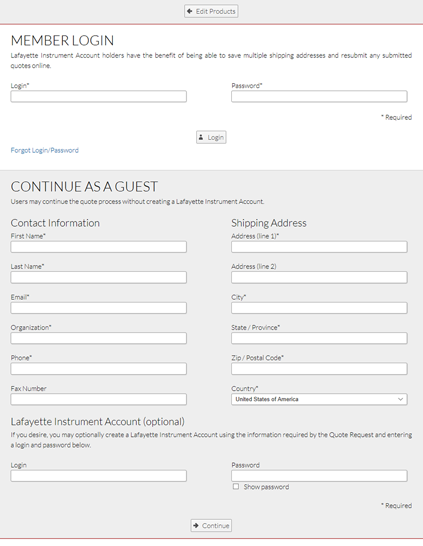 Upon choosing the products desired, the user will be prompted to login or enter a shipping address (as shown in Figure 3). Registered members can choose from a saved address or add another shipping address (as shown in Figure 4). Finally, the user must verify the entered details. A user may return to any point in the Quote Request process to edit. Once the information is adequately proofread, the user may submit the Quote Request. Our website will send an automated email containing an itemized price for each of the products that was requested.